Gestational diabetes is a temporary condition that pregnant women often develop during the second or third trimester of pregnancy. It gradually recedes after delivery. Similar to diabetes of other types, gestational diabetes relates to the body’s inability to produce sufficient insulin for absorbing glucose, thereby elevating glucose levels in the blood. 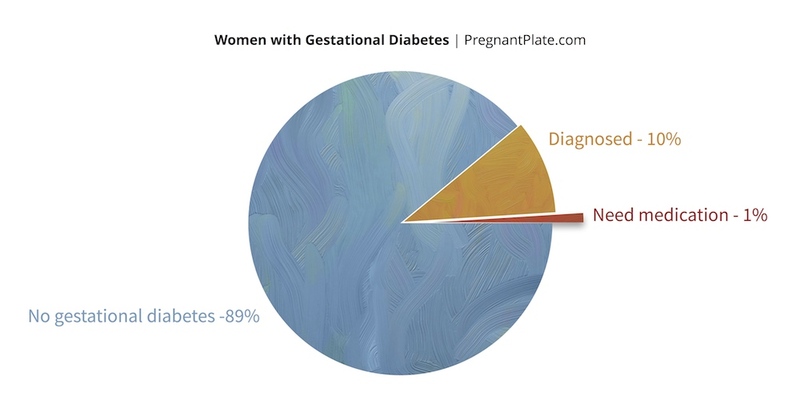 Most women get tested for gestational diabetes between 24th to 28th week of pregnancy. About 5 to 10 percent of all pregnant women are diagnosed with gestational diabetes. If you do get diagnosed, your practitioner will advise monitoring and controlling your diet before prescribing medication. Only about 15 percent of women need to take medication to balance their blood sugar. In most cases, gestational diabetes can be kept in check effectively with proper diet planning and healthy eating. The important thing to remember is that the objective of gestational diabetes related diet planning is to keep the spikes in control and maintain normal glucose levels. Continued elevated blood sugar may lead to early deterioration of placenta and in some cases, still-birth. However, most pregnancies with gestational diabetes, go on to normal deliveries and healthy babies. Focus on having a healthy mix of carbohydrates (starchy foods), proteins and fats for every meal. Proteins tend to keep you full longer and fats help delay the digestion of carbs into glucose. American Diabetes Association (ADA) recommends that each meal should be 25 percent protein, 25 percent starch, and 50 percent non-starchy foods, such as vegetables or salad. In terms of calories, the rough rule of thumb is 40 percent calories from carbohydrates, 20 percent from lean proteins and the remaining 40 percent from healthy unsaturated fats (See calorie chart for common foods). This tip will also help ensure you get all important nutrients from different sources for your baby. The carbohydrates intake in your diet directly impacts the blood sugar levels. Therefore, you need to watch which types of carbs you consume. Try to consume high fibre carbs as they take longer to digest and release sugars slowly into the blood. These types of foods are also called Low glycemic index (GI) foods. Examples of low GI foods include most fruits, vegetables, legumes, brown rice, whole grain cereals and breads, while high GI foods include fruit juices, ready to eat cereals, white bread and white rice. Since the objective is to balance out the sugar spikes, while ensuring sufficient nutrients reach you and your baby, it is best to consume smaller and more frequent meals, rather than three large meals. Try to eat something every 2-3 hours, including meals and small snacks. Avoid foods with added sugars as these translate into additional sugar in blood stream. Examples of foods with added sugars are candies, icecreams, cakes, canned juices and sodas. Remember that overcooking fibrous vegetables makes them lose their fibre and they become equivalent of carbohydrate intake in your diet. Therefore, when planning your plate, make sure your vegetables are not overcooked and still contain fibre. If you prefer overcooked vegetables, these should ideally be counted in your 40% carbohydrates quota. Highly processed foods should be avoided as they may contain high GI carbohydrates, saturated fats, added sugars and other potentially harmful ingredients that are difficult to track and monitor. Often a low carb intake at dinner time may either lead to waking up hungry midnight, and binging over harmful foods, or starving your body overnight. Such starvation leads to a chemical process called ketosis, which is not good during pregnancy. Therefore, a little carb boost just before bedtime is important to keep you full through the night. Ideally a glass of milk or a small snack with a mix of protein and carbs should do the trick. Above all this, monitor your sugar levels after every meal to learn more about how your body reacts to different foods and refine your meal plans based on your body’s reaction to certain foods. Following the above tips will help you manage your gestational diabetes and have a healthy pregnancy. Happy eating!